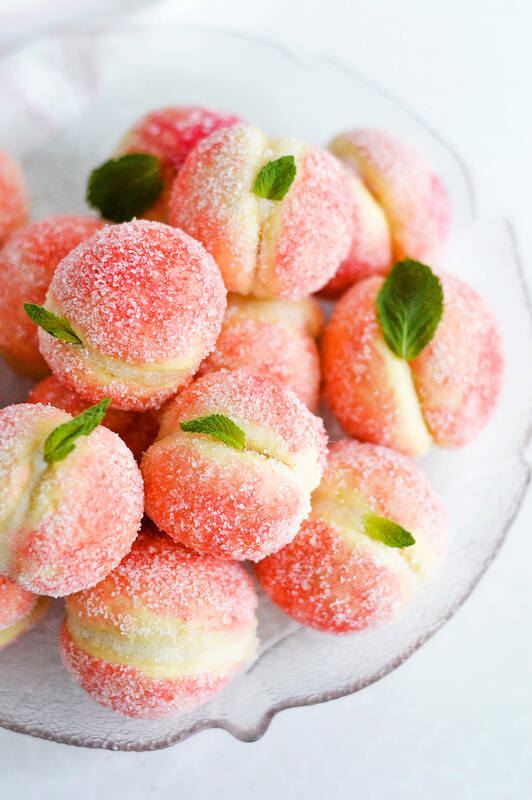 People will love you forever if you make them these orange infused sweet ricotta peach cookies! Between all the list making and preparation for our Amsterdam trip, all the cat-sitter coffee dates and day dreaming, these adorable peach cookies are what has been on my mind for the past few weeks. Because it’s almost summer and I can’t wait for actual peaches to start rolling in and because a good cookie is a good cookie, something I will never have a problem with. Remember these pretty mushroom cookies from last year? Well, these peach cookies are the distant cousins of those. I already knew at the time I’d be making them soon enough, but the season wasn’t right. And now I don’t have to wait anymore. Now, I can finally tell you all about these bites of heaven. 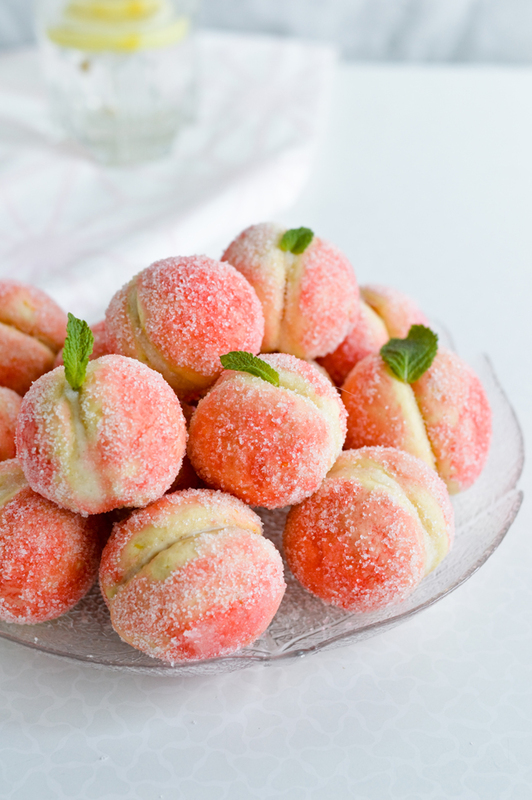 Originally, peach cookies are made the same way as the mushroom cookies, their shape being the only difference. And since I love the mushroom ones so much, I never thought I would actually change the recipe. But I have. And why oh why did I wait this long?! You see, the mushroom cookies are perfect for the winter months. They’re chocolaty and crunchy, the walnuts and the mushroom shape make them super festive and they fit right into the scenery outside – with leaves falling down, fog rolling in and temperatures getting colder and colder during fall and winter. And when I think about all of that I can’t possibly associate it with the warmer seasons and peaches. The mushroom cookies are a complete opposite of that, so all of a sudden making walnut peach cookies made no sense to me anymore. Lucky for me, these peach cookies aren’t (only) a Slovenian specialty. 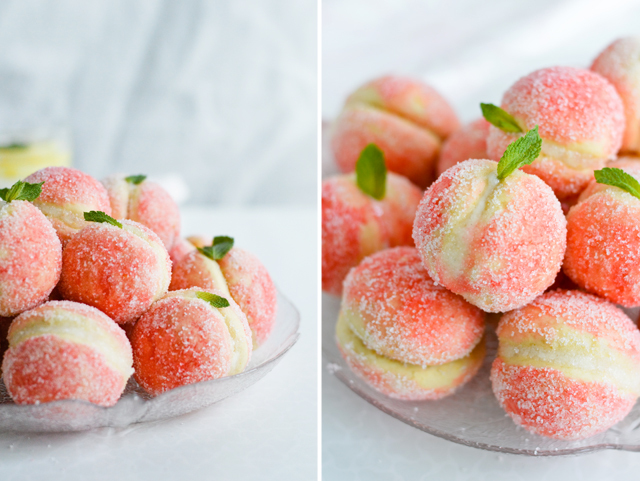 When flipping through Southern Italian Desserts , I found their version of peach cookies. Forget about the nuts, the chocolate, the jam, theirs are filled with ricotta. RICOTTA! That was just the biggest revelation for me. Why not do that? The thought alone made my mouth water. 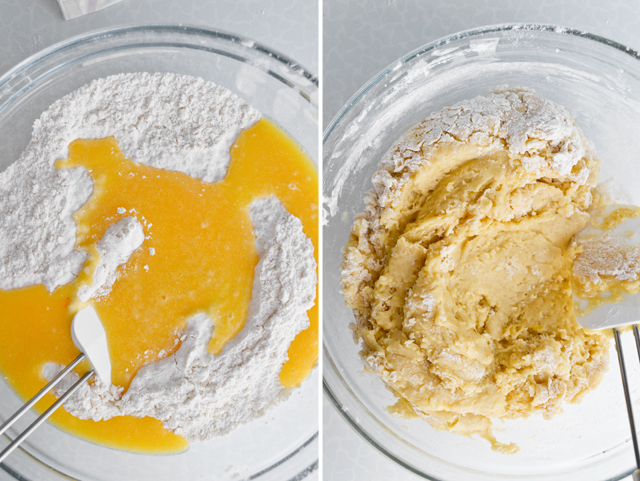 These sweet orange ricotta peach cookies are simply divine, I mean it. They’re soft, with just enough bite and crunch, they are moist, aromatic and so very adorable. 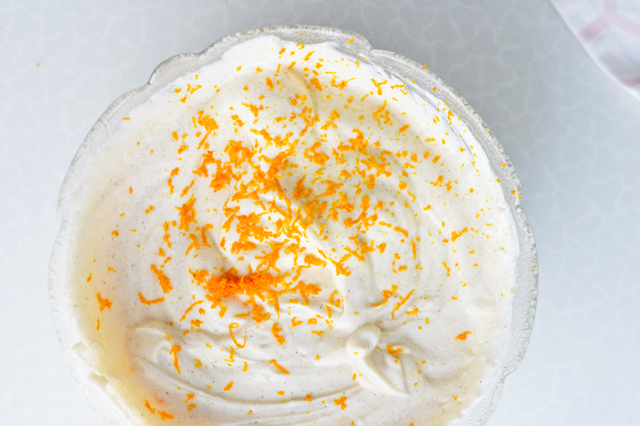 The orange infused ricotta captures the essence of the warmer season. It makes me think of breezy mornings, picnics in the park, the endless turquoise sea, bushy green trees and birds chirping in the air, it makes me think of ice-cold drinks in the sunset. It is the perfect filling for these peach cookies and makes them a much lighter and fresher version of its winter sister – the mushroom cookie. I will be bringing these to all BBQ/picnic gatherings in the following months, and you should too. 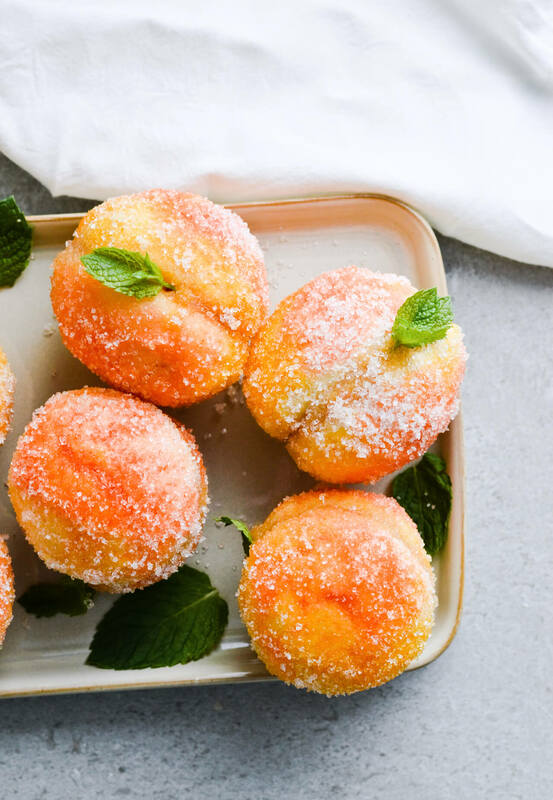 These orange infused sweet ricotta peach cookies really capture the essence of spring and summer. Recipe makes 22-24 peach cookies, each the size of an average apricot. 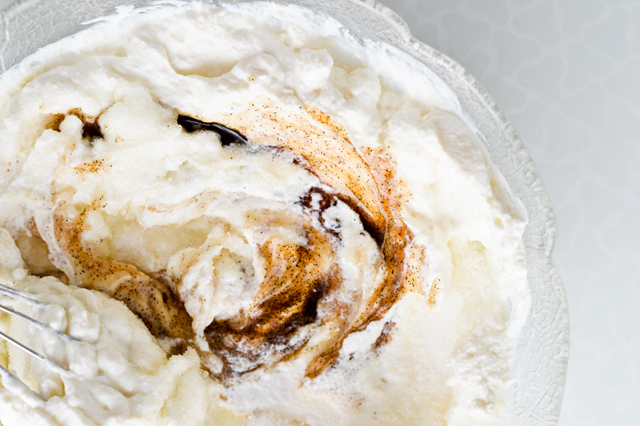 In a medium bowl, whisk the ricotta with sugar until smooth and creamy. Stir in orange zest and vanilla. Chill the mixture, covered with plastic wrap, while you make the cookies. Preheat the oven to 180 degrees C (350°F) with rack in the center of the oven. Line two baking sheets with parchment paper and set aside. Sift flour and baking powder into a large bowl. In another bowl, whisk the eggs and sugar until combined. Whisk in milk, melted butter and lemon zest until smooth. Mix the dry ingredients into wet in 2-3 additions, until well incorporated. Finish mixing the dough with your hands and press it into a ball. If it’s very sticky add another tablespoon or two of flour until it sticks together. Let rest for 5 minutes. 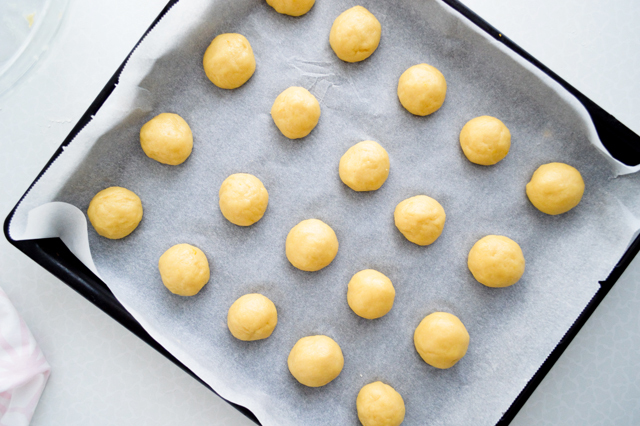 Roll the dough into 44-48 small balls (shape them with your hands until smooth) and transfer them to the prepared baking sheets. Place them about 2.5cm (1 inch) apart, as they will rise during baking. Press down each ball slightly, so the bottom flattens. Bake the first round for about 15 minutes, until bottoms are golden brown (the tops will remain pale). Rotate the pan halfway through baking. As you take the first tray of cookies out, put the second one in the oven. While the cookies are still warm, cut a circle in the bottom of each cookie and scoop out enough of a cookie for it to hold some filling. (Be careful, don’t pierce the cookie too deep or you risk breaking it.) Set aside. Do the same with the second tray. Next, find a pair for each cookie, you want the halves of the peach to be of similar size. Fill each cookie hole with enough ricotta filling that it covers it (about a teaspoon). Press the two flat sides of each half together and gently wipe away any filling that comes out at the edge. Brush each peach with food coloring (you can add a splash of rum to it), gently roll it in sugar and place on a large plate. Continue with the rest of the cookies. The food colors I most often use are from Rainbow Dust and Wilton. I hear people have great experiences with Americolor too. I’ve experimented with natural food dyes but none gave these peaches enough color. My goal was to make “white peaches” which are pinkish and white, while regular peaches are more red and yellow in color. The one thing I haven’t tried yet is beet powder. Its vibrant pink color could do the trick, so you can always try this too instead of using artificial coloring (and I promise to update you all on this as soon as I try this version myself). The fastest trick for me is this: I put the butter in a 500ml (1 pint) Pyrex measuring jug and melt it in the microwave in 10-20 second increments. Once it’s almost completely melted, I take it out and keep stirring it with a spoon, until it cools to room temperature. As you fill these cookies, make sure you put in enough filling – it needs to reach the edge of the hole you made into the cookie. Once you press the two halves together, some of the filling will come out. This is good as it is the glue that keeps the two cookies together and you just need to wipe away any filling that sticks out of the “peach”. Also know that while you are filling and coloring the cookies, the ricotta filling will get warm and consequently softer. This is why you need to chill these cookies before you serve them. The ricotta needs time to set. This recipe is adapted from a family recipe and from Southern Italian Desserts. Also try Strawberry ricotta apricot mini cakes! oh my goodness, these cookies are so pretty! I can’t stop staring at them! So glad I found your blog Alice! They look like real peaches. I bet they taste amazing too! I made these tonight…the color turned out just like your pictures, and they taste delicious, but I cant get them to stay together. I may have made them too big? Have you chilled them for long enough? Right after they’re made they are very fragile and can easily fall apart, so they have to be chilled for hours until the ricotta sets. 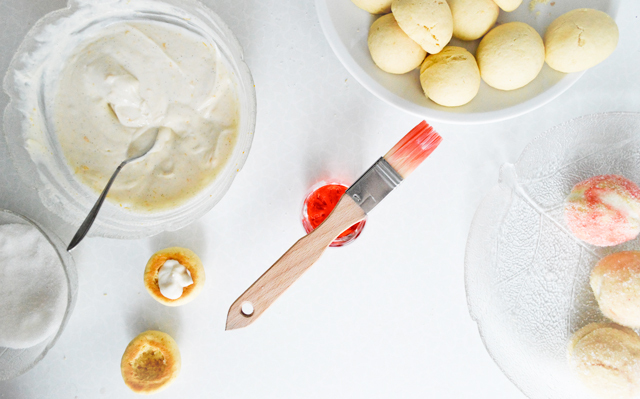 They also need enough filling – the ricotta is what keeps the two cookies together. It is possible that you made them too big and didn’t fill the holes enough, but I can’t be 100% sure without actually seeing them. I’m glad you like the taste though and am sorry that they didn’t turn out right. What camera do you use for your photos? They all look amazing! Hi Nicole, thank you! I have a Nikon D3200 and normally use a 50mm lens. Beautiful!!!!! My goodness- they are like perfection! Thank you so much, Loni! These are so, so beautiful! The color + the perfect round shape – they are just like real peaches. The sweet ricotta filling must be amazing. Yum! Haven’t tried these yet but definitely plan to. I’m going to substitute Peach Shnapps for the rum.Can’t wait to bake them tomorrow! Hi Vera! Thank you, I’m happy you like the cookies. I looked at your post and yours are so beautiful!! 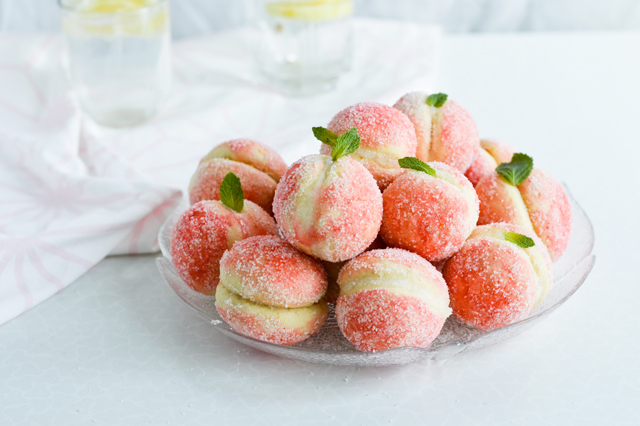 Your peach cookies are really beautiful too! thankyou for the recipe! I have been making these for years ( my recipe is a little different)and I also fill them with pastry cream, but I will try them with ricotta now! I wrap a little ball of dough around the outside of half a walnut shell and put the flat side down on cookie sheets. (I bought a bag of walnuts and gently cracked them open, removed the fruit from inside and use for other recipes) after removing from oven wait a few minutes and while holding them with a kitchen towel remove walnut shell gently by twisting and let them cool down. Now you have a cookie with a big indentation and u won’t have to scoop out anything. When cool, I prepare two bowls one with sugar and one with pink liquor ( I use an Italian liquor Rosso Antico) I dip each half first in liquor and then sugar and put them on cookie sheet with carved part facing the ceiling, when finished I fill each half with cream and press them together. The walnut shells u can keep and use them over and over. Thank you, Gina, for sharing your version! I really like the idea of using walnut shells, I might have to try that myself. Alice, these are gorgeous and I really want to make them for my boyfriend’s mother, but she lives in another state. If I gently sealed them (like vacuum, but not enough to crush the cookie) and put them in a tin and overnight shipped them, do you think they would last? And if you have any suggestions on how else to do this, please tell me. I wanted it to be her Christmas gift because I cannot afford much else, and I’m sure she would love them. Aww, that’s such a great gift! The only thing that I’m not 100% sure about is the transport temperature. Ricotta gets a lot softer if left in a warm place for too long. I do think that because we are in December and the temperatures are lower, the outside temperature shouldn’t be too much of a problem. I would definitely wrap them carefully. I would line the tin with tissue paper or paper towels or even bubble wrap, then I would wrap each cookie individually in plastic wrap or tin foil (this would keep them cold longer). When placed in the tin I would fill the space between the cookies with additional bits of paper towels, to act as a buffer. And then I would also wrap the tin with extra paper or bubble wrap, put it in a box and use overnight shipping, like you mentioned. I just wanted to let you know that I made this cookie for my 10th annual cookie exchange and it won best looking cookie!!! I uploaded a picture of them on Facebook and its gotten 99 likes and 43 comments along with several requests for the recipe. I can’t tell you how blown away everyone was with them looking like real peaches. Thank you for sharing the recipe and giving step by step instructions. For the most part everything was really easy to follow, however I found when I mixed the wet ingredients all at once the dough wasn’t as sticky. Wrapping the dough in plastic wrap and chilling in the refrigerator helped with rolling the dough into balls and when I rolled them on a wooden cutting board I got smoother balls with less cracking during the cooking stage. I’m looking forward to checking out more of your recipes!!! Wow, congratulations! I’m so happy for you and thanks for making my day. Chilling the dough is definitely a good idea for when the dough is too soft, it’s great you did that. Thanks for sharing your experience, Andie! I used to make these with my mom years ago. She filled hers with custard on one side, and a little chocolate pudding in the other side, with an almond in the middle. This is truly edible art! These look amazing! I’m definitely going to try this recipe! do younknow a good substitue for the eggs I want to make these but one of my friends happens to be allergic to eggs. Hi Robyn! Unfortunately I haven’t made these without eggs before, so I can’t speak from experience. But after digging around online, the most often mentioned substitute for cookies, and the kind people are happy with, is flax seed. To substitute 1 egg with flax seed, grind 1 tablespoon of whole flax seed in a coffee grinder/blender. Transfer to a bowl and add 3 tablespoons water. Beat with a fork until it becomes gooey like an egg white. For the peach cookies, you’d need a triple amount of that. You could also try making a half-batch first (just divide all ingredients by 2), to see how the flax seed works. I use 2 eggs when making only 1/2 recipe, so that’s 2 TBSPS flaxseeds with 6 TBSPS water. Personally, I would also add 1 TBSP of sour cream to the batter and if it ends up being too sticky and not smooth, just keep adding pinches of flour until it is. Can these be made ahead and frozen? I’d like to make these for the cookie table for son’s wedding in 2 months. Should I make the cookies ahead and freeze them already scooped out then fill them the day before the wedding or can they be made fully assembled and and frozen? Hi Toni! If freezing is a must, then I would freeze scooped out cookies and fill them the day before the wedding. Freezing ricotta worries me because it might release some liquid and you can’t fix that once the cookie is filled, so you risk ruining the whole cookie (making it watery or soggy). But freezing empty cookies should be fine if you put them in an airtight container, but separate the layers with some parchment. You could also freeze them on a baking sheet in a single layer, covered with some plastic wrap. I made these tonight and the cookie portion tastes a little dry. What could I have done wrong? Hi, April! The cookie portion moistens after the ricotta has had time to set. Did you scoop out enough of the cookie to add a good amount of filling? The filling to cookie ratio is what could’ve been off in your case, if you made the holes too small? And as you color the cookies, they get some of that moisture from the outside too. They also do need time to set and soak, because the cookie by itself is somewhat dry. But it needs to be as that’s the only way it can be filled and colored without it falling apart later on. Hope this helps! As some time has passed now from your comment, let me know if they’ve improved. Thank you Alice! You are absolutely right! The next morning I tried these and they were perfect! I was worried I made the holes too small but they just needed some time. I served them at a peach themed baby shower and they were amazing! P.S. That had to be one cute baby shower! Hi Alice, just found your peaches and they brought me to my very teen years, long ago. 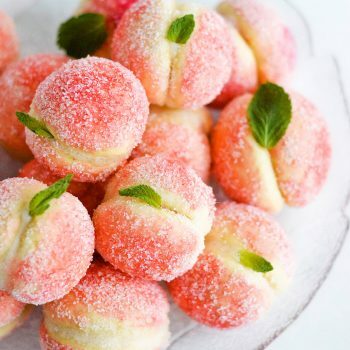 There are two main types of peaches treats that are often available here in Italy, and the one I remember is the other one, so I thought you may enjoy it too! A rich yeast risen dough, like a Veneziana, is used to make the halves, that are then joined with any filling of choice, and finished the same way. They look alike, but consistency is completely different! To dampen them they used Alkermes, or, if children were to eat them, some raspberry syrup, the sort you use to dilute with water to make soft drinks. It adds a hint of “peach melba” i find irresistible. Thank you for your tutorial and for bringing up old memories! I’ll definitely attempt to make these so thank you again for telling me about them. I tried making them this evening and the tops of the cookies all split. Any idea on why this would happen? Hi Brooke, I’m so sorry to hear that! Did they split all the way through or were there just minor cracks on top? From my experience this usually happens if you don’t roll the balls well enough. They have to be really smooth and compact. I almost always have a few cracked cookies, especially if I’m in a rush, but unless the cracks are really big, I use them anyway. The coloring and sugar tend to hide those splits pretty well. However, there are other things that could go wrong. I use a standard oven or a fan oven with the fan turned off. If you use a fan forced oven, you have to reduce the baking temperature by 20°C / 50°F. Because otherwise the outside of the cookie will cook faster than the inside, which could explain the cracks. This is more likely to happen when using a mixer on a higher speed. As you mix the ingredients together, a lot of mixing can produce a lot of air bubbles which can cause cracks. This could potentially be a problem. The recipe works for me, but moisture in anyone’s kitchen can affect both the powder and flour, so the recipe may end up not working for you. You can try removing 1/4 tsp baking powder next time and the cookies should still get a nice rise. Also make sure you don’t use too much flour when kneading – you want the dough to be smooth, but not dry. Thanks for your quick reply! I mixed by hand and use a regular oven, but I may have overhandled the dough or used more flour for sure. I live in a very humid area (that’s about to be hit by a hurricane, so is more humid than normal). It is very awesome that you take the time to answer back. I love your blog and will definitely try again! Thank you so much for your help. You’re welcome! I’m glad we got to the bottom of this. Hopefully everything works out next time and if you find the time please report back, I’m curious about the result. And a hurricane sounds so scary! Hope you are safe and don’t get hit hard. Hi! These are beautiful. Do you think I can substitute the flour for gluten free flour? Hi Katie, I’ve never made these gluten free, so I can’t speak from experience. They recommend using GF all purpose flour and adding xanthan gum to it, which is supposed to do what gluten does in regular flour. So, I would use 2 or 2 1/2 teaspoons of xantham gum for this recipe. And possibly another egg too. I’ve never frozen these before and I have no idea how they’d turn out. I’m worried that freezing might ruin the ricotta filling. Freezing ricotta on its own might work (and my quick search online tells me that people do it), but here it’s stuffed in a cookie and thawing it might ruin the cookie, making it wet and soggy. One idea is that you make a test batch and try freezing some to see how they turn out. And congratulations on your daughter’s wedding. Would these be okay to make and fully assemble, then leave in the fridge overnight to set? What a very delicious recipe! I’m pretty sure my kid’s going to love this! I’m definitely gonna bake this one on the weekend! Thank you so much for sharing!